The Visual Science Lab / Kirk Tuck: Putting Product Selection to the test. Did I make the right decision for my event camera? Putting Product Selection to the test. Did I make the right decision for my event camera? 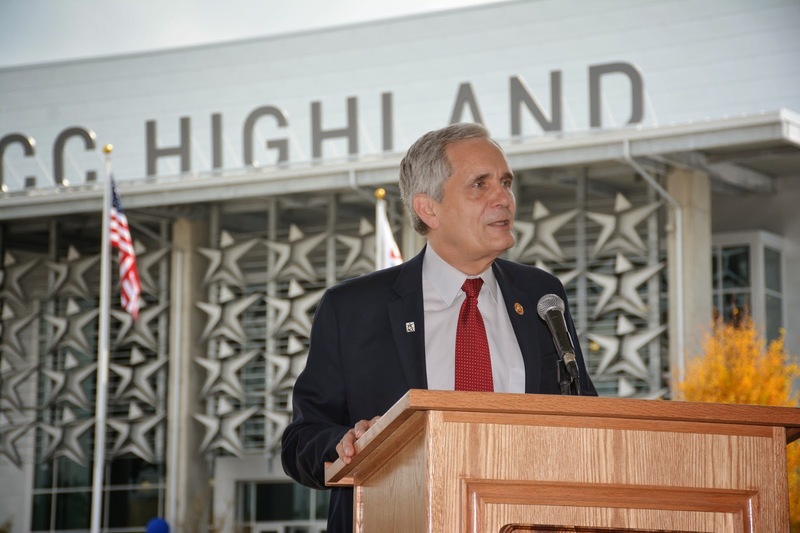 new Austin Community College campus at Highland Mall. 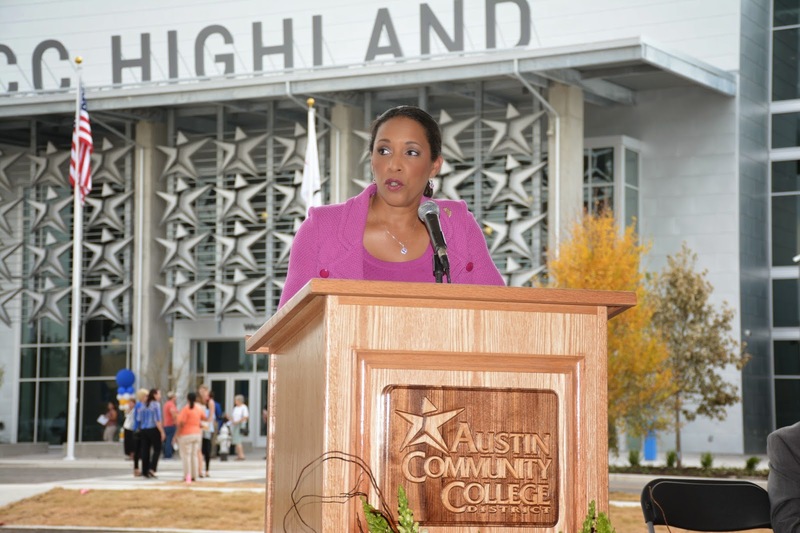 Texas State representative, Dawnna Dukes at the same event. I recently tested cameras with flashes and came to realize that, for me the camera and flash combinations available for the GH4 weren't adequate for my use in event work (notice that I've said, "my use." I'm sure many readers are more adept at finding the right combinations of products and settings to make the m4:3 options successful. Just not working for me...). The two images above are classic examples of times I need good flash. The speakers are under the cover of a tent while the building in the background is in full daylight. The difference between the background and the speaker in the foreground is at least three and a half stops! I followed directions: I put the camera into matrix metering mode, S-AF, center focus point and focused on my primary subject. The images came out looking just like this. This is not a situation where it was possible to pre-light anything. I had several hundred people in the audience behind me and I was surrounded by six or seven other working photographers all trying to get the same decent shots. I would love to have bounced the flash off the white ceiling of the tent but I couldn't spare the flash power to get the right exposure and match that bright background. I could have used manual camera exposure and manual flash exposure but who wants to chimp, chimp, chimp through a fast moving assignment with lots of speakers and the need to also get audience reaction shots on the fly? I haven't done any post processing to the shots. In fact, you can look at the two sides of the frame and see the obvious geometric distortion provided by the 18-140mm zoom lens. I am very happy with the results. I'll straighten the lines but at least I'm starting out with a well balanced frame that will work well for my client's public relations needs. It's a lot easier to straight a frame than to fix an unbalanced foreground/background lighting error. I am happy with all the image quality aspects of the camera/sensor/flash. The files are detailed, well white balanced and tonally happy. My only real complaint is how much I miss being able to chimp in the finder of an EVF camera to see if I got what I needed while I still have the camera up at my eye level. After I used this camera and lens for an event in the morning yesterday I spent time shooting the Panasonic GH4 and the 35-100mm for corporate portraits in the afternoon. We were shooting in continuous light and it was so wonderful and fluid to shoot that way. The images looked incredibly good as well. In the same ballpark for sharpness and smooth tonality as the Nikon. The only differences really showed up in basic handling differences. To round out my day I shot a rehearsal of THE KING AND I over at Zach Theatre. That job was done almost entirely with the Olympus OMD EM-5 and the 25mm f1.4 Pana/Leica lens. It was fast, did a great job automatically color balancing under weirdly mixed lights and was both sonically and visually unobtrusive. Not every camera works perfectly for every imaginable scenario. Yes, you can press most modern cameras into doing everything competently. But isn't it a privilege to work with the best tools for the project in front of you? I could have made the GH4 work with manual flash at the press event but it would have added several layers of complexity and required much more fine tuning and equipment supervision. How nice to have that done for you automatically. I could have used the D7100 for the theatre images but it's so much easier and nicer to pre-chimp fast moving and unpredictable rehearsals so you know what you are getting while you are getting it. It's more efficient. And the smaller camera is more pleasant to use. Looks like a job well handled under wretched shooting conditions. The only way to make that background more difficult would be to install strobing neon to accentuate the geometric patterns. Does the Metz offer the same option Nikon calls "balanced fill flash" in its Speedlight series? It appears to be the same result. Hi Michael, my anxiety always goes up a little when I get some place and the organizers have put the speakers under a tent and left the full sun outside as a background. The Metz flash does a good job with balancing and also features the t/l/bl for backlit stuff. I compared the flash to the SB700 and it's pretty much equal. Very interesting comparison and useful to know about. I get the impression that you like the extra dynamic range of the D7100 sensor coupled with the excellent flash system, zoom lens as well as VR. Sounds like all of that promotes the processing flexibility and reliability in the field for your recent assignment. When the lighting is controlled do you prefer the GH4? I look forward to possibly reading about your experience and very good results with using the Nikon 35mm f1.8, 50mm f1.8g, if you have those lenses. Balanced Fill Flash is iTTL-BL and basically a function of the camera, and thats supported with nearly every recent flash. As these models should have some power- was the ceiling very high or was reloading time a concern? Usually (as long as there is no sun to fight with) they should do also a good job with bounced flash. I do something similar for my grand kids running around at their "Events". This is basically sports action photography only the action is slower and still needs to be frozen to catch the moment. Flash using TTL fits this requirement and Nikon has always had really good TTL capabilities built into its cameras and flash units. The images look really excellent. Good choice on the Metz flash. Good quality for less money. The Nikons have wonderful bounce flash capability in my estimation. I tend to shoot in manual mode with flash, with the settings set for underexposing the ambient. There is only one thing I can't stand when pre-chimping on the EM-5: with pure manual exposure (M on the dial), the screen and EVF compensate for very dark or very bright scenes by showing an image that has been changed from what the eventual result will be. For example: with under-exposure, they show a much brighter image than the actual final one will be. That can be very disconcerting. I have been unable to find a setting that will stop that auto-adjust of the screen and EVF. Very frustrating. I too love aspects of my Nikon system, and after a fling with a Fuji mistress (love so much about what they do) might coalesce around them again. But I'm eyeballing the GH4 as a great all around shooting platform that can known down outstanding video. My days of shooting senior sessions are about done and who couldn't love the lens array M43 offers? Dave, it's a sad time to be a photographer with an open mind because there are so many countervailing choices. GH4 is still the stand out for video (and really, really good 16 mp image files). It's also a fast and sure focuser. The Olympus EM5 actually may be the best Jpeg machine I've ever used. The Fujis now have the image quality and the handling. In fact, the only thing the Nikon D7100 does really well is....flash. AUSBOOM!!! It's all happening in Austin, Texas.